Comments: Open Water is the type of movie that I love to write about. Because I know that just about everyone reading this countdown has probably heard of it. In fact there are many people out there who actually saw it. It came out in 2003, it (pardon the pun) made a big splash for a while, and then for whatever reason it just sort of dropped off the face of the Earth. And now, nearly ten years later, I get to write about it again. And when people see the title they are inevitably going to think, "Oh hey, I remember that!" Open Water is the type of movie that I like to call a get inside your head movie. Because it is scary, but it is a different type of scary. It isn't the type of scary that you watch for 90 minutes, you scream maybe once or twice, and then you forget about it. No, this is the type of movie that just sort of lodges itself in your subconscious. You might not even think it is all that scary when you watch it, but then maybe twenty years later you will be out scuba diving or snorkeling in the ocean, and that is when you will remember it. And that is when you realize how frightening it was and how much it stuck with you. For another good example of a get inside your head scary movie, try something like Deliverance. Or Spoorloos. Or one of my personal favorites, the Blair Witch Project. The plot of Open Water is very simple. A plain old ordinary American couple is on vacation in the Bahamas. And one day they decide that they want to go scuba diving. So they go out on a diving tour with 18 other people. And, well, at some point during the dive the captain of the boat miscounts how many people went down in the water. So when 18 people come up, he loads them up on his boat and he takes off back to shore. And meanwhile he forgot that two people are still down in the water. And that's it. Seriously, that is the entire plot of the movie. 20 people go down, 18 people come up. And poor Susan and Daniel are now stuck out all by themselves in the middle of the ocean. 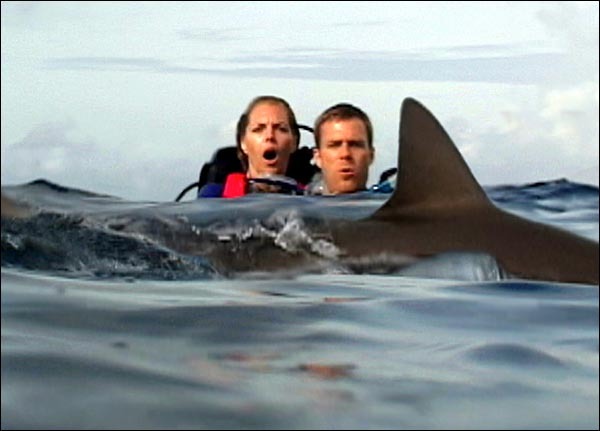 If I could use one word to describe the rest of the movie once Susan and Daniel are stuck in the water, it would be "uncomfortable." Because man, this is one uncomfortable movie. It is just you and these two people out helpless in the middle of nowhere. For an hour. And the whole thing is filmed digitally, with only ambient sound, and with no special effects. And it is filmed completely at water level. In other words, it is like you are more or less watching a snuff film. 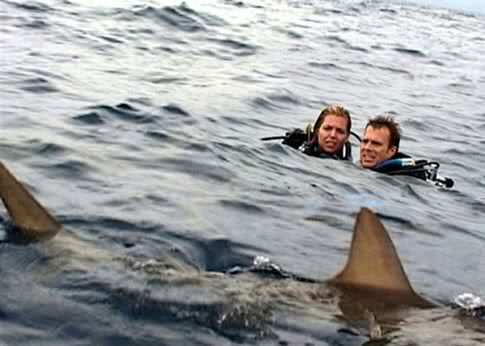 You are just sitting there waiting for these people to be eaten by sharks. You don't know when it is going to happen. You don't know how it is going to happen. You don't know if there is going to be a warning, or if it is just going to happen all at once. Basically you are sitting there waiting for the sharks to strike just like the characters are. Like I said, holy crap. This movie is just a whole different type of scary. But mostly it is just very uncomfortable. Open Water isn't a movie for everyone. I know people who saw it when it first came out and they HATED it. They went into it expecting a movie like Jaws, and that isn't what this movie is trying to do. It is nothing like Jaws. So people who go into it expecting a straight out action/horror movie are going to be disappointed. If you want a SUSPENSE movie, well there really are few movies as effective as this one. Because once they are in that water, and once those sharks start circling, well at that point all bets are off. Because like I said, you know it is coming. You know exactly what it is coming. But you don't know WHEN it is coming. And you don't know from WHERE it is coming. And the way that the movie is filmed, the director basically puts you right there in the water along with them. You know that there is something living and circling around underneath you. You just can't, you know, actually see it. What makes this movie especially freaky is that the director used real sharks. There was no CGI, there are no special effects. It is clearly real sharks circling around under real actors. In fact in many ways it is like you are watching a documentary. Hey, here is what happens in nature when sharks hunt people. 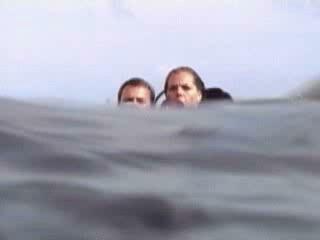 Like I said before, if you want a movie that is flat out uncomfortable, try watching Open Water. You will never forget it. It is one of those movies that will just store itself in the back of your brain. And then one day when you are swimming around in the ocean you will suddenly remember it. And you will wonder what that thing was that just bumped up against you. I don't have much more to say about this movie because it is all pretty self explanatory. It is just a two man movie crew (seriously, this movie had a two man crew), two actors, a ton of sharks, and no special effects. And no music. For the most part all you hear in the movie are ambient sounds. Like water sloshing. Or seagulls. Or shark fins splashing. It is just creepy as hell and like I said before, it sort of feels like you are watching a snuff film. It really does feel like this is actual footage of people who got stuck in a nightmare and at the end they will probably die. In fact I think in his review of this movie Roger Ebert said that after he watched Open Water he just wanted to go outside and stand out in the sun because the movie got under his skin too much. He said that at a certain point in the story it crossed the line between movie and reality and he actually started to believe it. He also said that very few movies have the ability to do that to him. So anyway, there you go. Open Water. It is not a movie for everyone, but for the people it affects, it REALLY affects. If the Blair Witch Project creeped you out, if you have any sort of phobia of deep water or sharks or being stranded at all, well this movie will probably be a little too intense for you. I just wanted to throw it onto my list because I think it is a kickass little movie that does suspense really well. And I think it is amazing that it was made by two people for only about 130,000 dollars. Seriously, 130,000 dollars! I know movies with a catering budget higher than that. This is the kind of creative little project that they teach in a film class. Oh yeah, one last thing. Like I said, this movie unfairly gets compared to Jaws. If you go to the Internet Movie Database, about 75% of the reviews there will be people who were expecting it to be Jaws, and they are pissed that it wasn't. So they get mad and they give it a low score. Well let me say this. 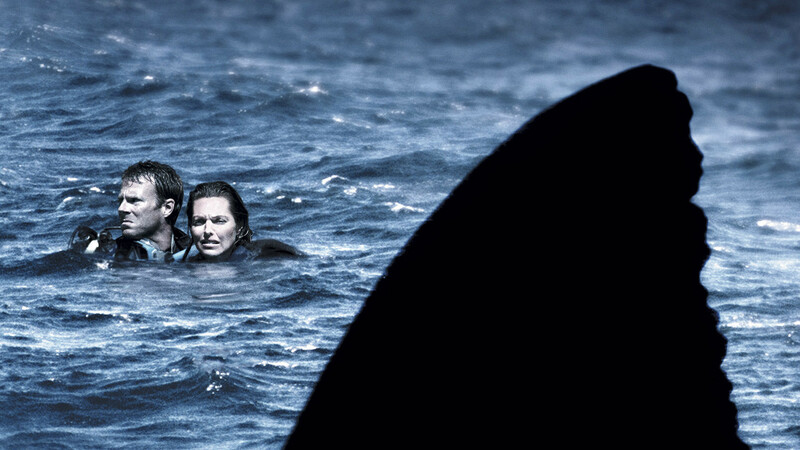 This movie is kinda like Jaws, but only in one part. You know that scene in Jaws where Quint talks about the USS Indianapolis, and how it went down carrying the bomb? And how hundreds of men were stuck in the ocean all night, just bobbing up and down and waiting for the sharks to take them out? Remember how horrible it was to hear about their fate? Well just imagine that you took that USS Indianapolis accident, and you filmed it in real time and you only showed it using ambient sound. Imagine the reality of what it would be like to really be right there in the water along with those men. Just waiting to die. Imagine if you had to sit there and wait right there along with them, and you got to experience every single minute of it. So yes, it is like Jaws. Kind of. It is kind of like the creepiest part. An hour ago i finished watching Open Water for the first time and i still cannot stop thinking about it. What a powerful film. I walked away feeling deeply saddened, though somewhat disturbed, yet altogether moved. I am so so glad that Hollywood didn't get a hold of this story and make a typical box office affair of it. The way the movie was shot (on hand-held digital cameras) totally allowed the viewer to feel the same level of desperation as the couple would have been feeling. I truly felt their desperation, the sense of hopelessness was brilliantly conveyed in the film. For once viewers were not given the storyline straight up and were actively involved in unraveling the story the entire film. More movies should leave me feeling effected like this one has. That's what movies are meant to do, they just don't seem to anymore! Congartulations Open Water - you did what so many big-budget thriller/drama films fail to do - you actually got to the viewer. This movie scared me. I can't think of any other movie that has actually scared me. There's something about being left in the middle of the ocean, with who-knows-what underneath the waves.. while you eventually come to the conclusion that you aren't going to be rescued. The worst/best part about Open Water is that it's based on a true story. People may complain about Open Water being just "two people in the water for an hour", but they are missing the point. The slow descent of the two main characters into pure hysteria, and then utter despair, is really horrific. The excellent use of weather, lighting, and actual marine footage makes the experience seem all the more real. Granted, some of the initial dialog may seem cheesy. And the end of the film may seem abrupt. But if you really pay attention along the way and get in to what's going on, you'll find this movie is really damn scary. Being a scuba diver myself I was most eager and curious to see this movie and would first like to say that it is hands down the most realistic and accurate film about scuba diving I have ever seen. It's also a very engaging and tense thriller. I am familiar with the true story I believe this is based on, and can tell you, from what I have read about the incident, this movie is extremely accurate. As a diver I can tell you that when floating on the open ocean you are very much at the mercy of the currents, and whatever else mother nature wishes to throw at you, and sink or swim, there's virtually nothing you can do about it. Every detail of this film is right on the nose, including the faulty headcount that sets things in motion, believe me I have seen it happen! Shooting on digital video, that has a rough look, was a stroke of genius and adds greatly to the sense of immediacy and extreme realism. This film would have been way less effective if done the usual glossy, expensive Hollywood way. Same goes for using the two unknown actors, who are excellent, and all those real sharks! It's like watching a video diary of a nightmare vacation. I found it to be a very original, gutsy, well crafted thriller. Believe the hype! It really doesn't surprise me that some people don't like this film. After all to truly enjoy Open Water one must open their mind and think. In this day and age that hardly ever happens anymore. Most filmmakers just decide to blow things up and hope that it's enough to entertain their audiences. Society in general has become numb what with the plots just laid out in front of us never questioning or asking us to use our imaginations. Open Water is a film that asks its viewers to place themselves at the heart of the movie; to feel the desperation, the hopelessness and the absolute terrifying ordeal. And for a change the movie is shot in a way that allows the viewer to feel as if truly there. Is it Jaws? No and its not meant to be. Maybe that's where the confusion lays. Open Water is a suspenseful film, excellent at that. If you're someone who actually enjoys figuring out the movie for yourself instead of being told in the first five minutes this is the film for you. Score: A.
I found this film terrifying to watch. I've been in a similar situation, except for the sharks. You can't imagine the feeling of being alone in the ocean, far from land, not knowing if you'll make it back to shore. I had drifted out a ways trying to reach a floating log in the Pacific. My friends were hung over and passed out on the beach. It was early morning. I finally reached the log not realizing the tide was going out and I was being pulled further out to sea. Once I discovered what was happening I jumped back in and started for shore, quite a ways to go. It took calming down, floating a lot, and continued paddling to get ashore. When I finally touched bottom, I crawled up to the beach and collapsed. With the tension, fear of drowning and exertion of strokes, it totally exhausted me. Also wondering what was underneath the surface, not seeing it. I thought this film brought that terror out. It was filmed as though you were right next to the couple. The use of the water level being right where your eyes would be, made it so real. I wondered where the camera was and how did they get that level of eyesight? Chris Kentis wrote and directed this with a keen eye and a good sense of tension mounting. He also brought out excellent performances from two newcomers, Blanchard Ryan and Daniel Travis. I thought the were very convincing in their performances. I found at times that I was no longer watching a movie - that they were really in the danger that existed. I also think it was possibly beyond the call of duty to put the actors through the paces of being in the water so long. Not your usual demands of actors, unless it were a fish tank and fake waves. But this was real and they were in the middle of the ocean. Hats off to all three involved - Kentis, Ryan and Travis. Chris Kentis also did the camera work as well as editing the film. Good work, Chris. You got me with this. Open Water was one of the greatest movies I have ever seen. Being a complete dive bum, I have dived in open water with nobody but myself before. If you can't relate to this, then don't write a review telling how awful the movie is, because Open Water is exactly the opposite. Based on a true story, Open Water is a terrifying (once again, for those of us who can actually relate) experience, with the emotional horrors of loneliness. People say that the movie is boring because there is no other setting other than the ocean for an hour and a half, but you have to truly love the ocean and it's beauty in order to find where the heart of the film lies. Being alone in the water, with no one around except Bull sharks (who by the way are rated as the number 1 most deadly shark in the world, ahead of the Great White) is absolutely horrific. It doesn't take much intelligence to hate this film, because thoughts and experience with the ocean itself are necessities to understand the films message. I have also dived at night time as well. As all professionals scuba and free divers know, this is a very, very dangerous and unnecessary risk to take. If I learned anything about night diving in the ocean, it is the sickening nervous feeling in your stomach. You can't really see what's ahead, until you come almost face to face with whatever lies ahead, such as a coral reef. Never have I night dived again. Night diving, by far, is the most petrifying thing I have ever done. This is probably the reason that I had to bite down on my napkin during the night scene with the Tiger Shark. This indeed brought back memories, and I began to really be scared not for myself, but just for the characters. There are few things scarier than diving at night. And no, I'm not talking about diving a few yards from shore. I'm talking about a full on free dive, just as if it were in the morning. Of course, the film was completely realistic, because it was not a Bull shark in the night scene, it was a Tiger Shark. Tiger Shark (my favorite shark by the way) is known for hunting at night. Overall, Open Water is a completely realistic (they used real Bull Sharks) insight to loneliness, fear, and coming face to face with the ocean itself. I said it before and I'll say it again: it takes experience to understand this film. 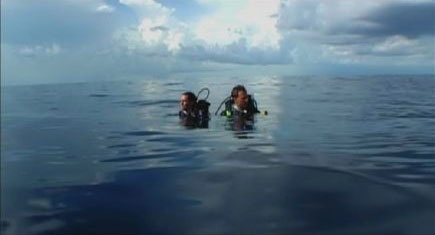 I have an abundance of experience, and take it from a dive bum himself: no other movie tells the truth of fear like Open Water. * This film is inspired by a true story about an American couple, Tom and Eileen Lonergan, who in 1998 went with a scuba group (Outer Edge Dive Company) to an area off the coast of the Great Barrier Reef in Australia. They were accidentally left behind due to a faulty head count taken by the dive boat crew. There were 26 other divers and 5 crew members who failed to notice that the couple was not on the boat. It was not until two days later on January 27, 1998, that the pair was found to be missing after a bag containing their passports and belongings was found in the dive boat. A massive air and sea search took place over the following three days, but failed to find them. The couple was never found. * Filmed mostly on weekends and holidays over two and a half years. * The entire movie cost less than half of the cost of a typical Hollywood movie's sound effects budget. * No CGI was used in this movie. Director Chris Kentis fed the sharks tuna to get real feeling of the main characters being in the ocean together with the sharks. As long as they were eating the tuna they didn't harm the actors. 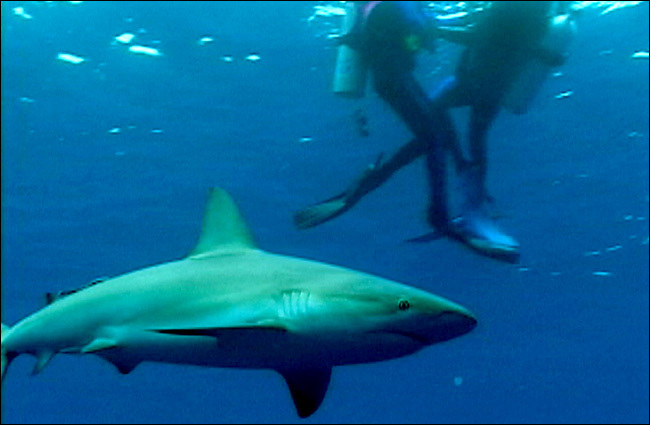 * The sharks used in this film were Caribbean Reef Sharks. 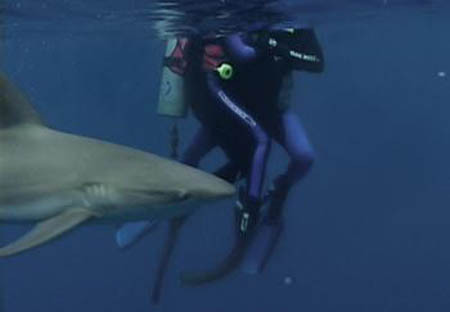 The cast wore chain mesh under their diving suits for protection and though none of them was bitten by the sharks, Blanchard Ryan (Susan) was nipped by a barracuda on the first day of filming. In the movie, after Susan is bitten, her boyfriend says, "It was probably a barracuda seeing what you taste like." * Susan and Daniel's last names are revealed on their ID cards; hers is Watkins, his Kintner. In Jaws, the skinny-dipping girl who serves as the shark's first victim is named Chrissie Watkins, and the second victim, the young boy who is killed on his inflatable raft, is named Alex Kintner.